Making something in the UK that conforms to the EU regulations applicable is one thing, to develop an engineered product that is entirely fabricated in the UK, exceed these standards, and costs less than anything comparable is frankly astonishing. "But that’s just what we’ve done," said a justifiably chuffed Ian Hall making his first announcement in his new role as sales director at Total Solutions Group (TSG). "The Euro Code 9 standards gave us pause to re-examine our entire product line; eighteen months later we have OV Truss up and ready to go. 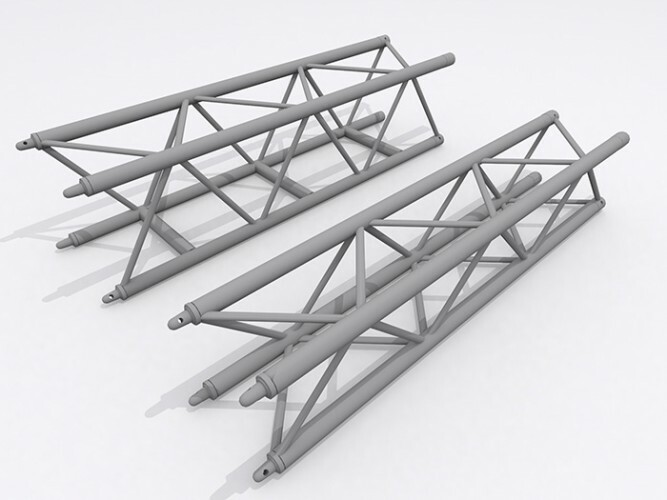 Currently available in two forms, OV Truss is a square truss with either 30 or 40 centimetre chord centres. Where it differs is in the web; we have developed a special extrusion for the web that gives a strength gain of +15% above the Code 9 standard. Length for length it’s also lighter than anything comparable, and faster to fabricate, which is where the cost savings are made. Developing OV has allowed TSG to re-examine all the many applications to which truss is used in the modern entertainment world. By pitching the material specification to give maximum strength whatever orientation it’s suspended, we have achieved structural gains in strength while maintaining a competitive price." TSG will supply OV into the European, Middle Eastern and Asian markets, while Stage Audio Works in South Africa will be manufacturing the same product under licence for customers on the African continent. As Hall indicated, OV is just the first development in what is an on-going program of reappraising the full TSG product line. "The lessons we have learned developing OV are quite profound in engineering terms. You can be sure they will be applied to all future offerings," he said. The OV Truss will be launched at PLASA Focus in Leeds next week.